Often when I mention Wellfleet to people, if they know of it they often ask if I like oysters. The answer to that question is no, unfortunately. But people ask because Wellfleet is world famous for its oysters. Oysters are such a big deal in Wellfleet that the town holds an annual Oyster Festival every fall. This year, the Wellfleet Oyster Festival will be held October 19 -20. Learn more about the Wellfleet Oyster Festival here. Speaking of oysters, as I have been scouting antique stores and auction galleries in recent times, I have become acquainted with oyster plates, which are apparently quite collectible. I was interested learning more about oyster plates – some of which are quite ornate – so I did a little research. 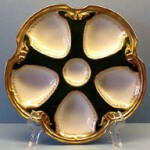 The Kilmarnock Antique Gallery is a great source for information on oyster plates. Kilmarnock Antique Gallery of Kilmarnock, VA is the home of the self-proclaimed “Oyster Plate Lady” and they offer a great collection of oyster plates. Just a quick look at their online collection of oyster plates will allow you to see the great variety of plates out there and why they are so collectible. 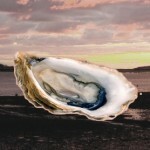 Meanwhile, Paris-based OysterPlates.com offers everything you ever wanted to know about oyster plates and offers and impressive gallery and museum of oyster plates from all around the world. Lost Cowboy is powered by	WordPress 5.0.4 and delivered to you in 0.936 seconds using 40 queries.